The Modular Display Systems Use Poster Holders to Show Custom Graphics! Modular Display Systems Feature Clipframes Holding Promotional Posters! The modular display systems include poster frames that make it easy to promote different good and services at your business in a stylish manner. The exhibition poster display includes many sizes that help you to find the right one that will draw in passersby and help them want to learn about your products. Trade show stands, poster stands for exhibits, and other modular display systems are used in many different locations to great effect. Retail stores place these stands around their business in order to promote upcoming events or ongoing sales so that customer's know exactly what is going on in regards to promotional events! They are also used in car dealerships, as well as retail stores, to show product information including specifications on different aspects of products, warranty information, and other ways that employees can use to upsell items using visual cues that are helpful for customers to better understand products. These exhibition poster displays, modular display systems offer an inexpensive way to create an attractive display that helps to get the attention of passersby and then communicate important information with ease! The exhibition displays are modular in nature, allowing you to easily adjust the unit to meet your needs. Having specific ways to display your promotional posters is standard for any business, but finding the right style that will work for your needs can be difficult. Even then, with retail and trade show environments can change from day to day, so having an adjustable display that can meet your needs is a key component. That's where these exhibition holders are able to surpass other displays with their easily adjustable nature. Each component is able to be moved up and down the centre pole, allowing you to position your poster frames to best be seen, whether seen from across a room or placed perfectly alongside a merchandise stack on your sales floor. These trade show displays have many other accessories available that are able to be purchased and added to the display. These accessories include brochure holders that hold various sizes of literature that allow passersby to take information home with them that let them better make informed decisions regarding your products, services, and events. 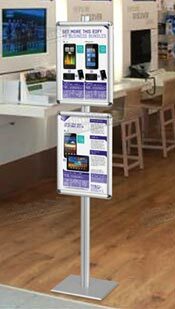 By adjusting the components on the centre pole, you can easily change the height of both poster holders and brochure displays in order to best be used & seen by potential customers. Only simple tools are required for changing the height of the components as well, with the hardware necessary being included in most cases! There are poster snap frames included with each pole that allow you to advertise events, promote upcoming sales, and show product information to potential clients. Different sizes of graphics are offered in order to allow various businesses to find the right fit for their needs. A3 (297 x 420mm) graphics are able to be used with these holders, using larger size graphics to better grab the attention of passersby, drawing them in and making it easy to promote in an eye-catching manner. There are also A4 (210 x 297mm) sized frames offered that are used to show smaller information, with many businesses using the top graphic to get the attention of passersby and then the smaller frame is perfectly apt for showing product information as well as menu items when used at restaurants, cafes, and coffee shops. Both these frames are able to be attached to the holder in portrait or landscape orientation in order to offer a versatile display. Your marketing team will be thrilled that they have the ability to come with different graphics without being constrained by orientation, as you can quickly and easily change the orientation of these displays without having to attach new frames! 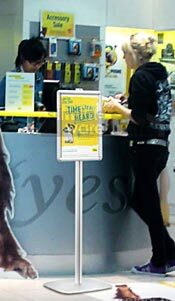 Anti-glare lenses are provided with each frame, helping to prevent vandalism by protecting the graphics during public display. Vandals will be deterred from marking your posters as the extra step necessary and time required will draw too much attention, making posters in these frames a less likely target. These anti-glare lenses also improve readability in different lighting conditions, helping passersby to see exactly what your graphics are promoting. Switching out your posters during change-outs is easy with these exhibit displays, as clipframes are used that require less than 1 minute and no tools for changes! Simply snap the (4) sides of the frames open, remove the old poster with lens, replace, and snap shut! By using displays that feature quick changes it's much easier for employees to focus on more important tasks during their business day! The stands are are made from anodised aluminium, providing durable displays that are able to be placed in any location with little worry of breakdown. Purchasing these units provide a good return on investment, as the materials use allow you to place these stands at your location for years to come with only minor damage occurring on the stands and little chance that they are so adversely affected that they are no longer usable. These strong units feature a professional silver finish that is able to work with any décor, and brings a classic look that is readily identifiable to customers. These exhibition displays for custom posters are portable displays as well, easily able to be moved into position at your business by any employee. The base of the display is solid, offering a stabilising force that allows the unit to be sturdy when used in any location, with a deliberate force having to be applied to knock it over, another great feature when placing the stand in public areas. Assembly of the units is a simple task, with all tools necessary for set-up included with your purchase. It's not a lengthy task to set-up the display either, usually less than 10 minutes is needed to place all components on the stand and attach the solid base. These displays are great for use in many different locations, all available at a low price that won't break your business budget but without compromising on quality in order to ensure a long-lasting product. Order for your business today to utilise these high-quality stands to help lure in customers! With so many types of exhibition poster displays available to pick from for your business, it makes it easy to find one that will work for your needs. Whilst the trade show stands on this page feature only graphic holders to display custom designed graphics, we also offer versions that feature only brochure holders to easily distribute literature to potential customers. There are also configurations available to that have both snap frames & brochure pockets to get the best of both worlds and really leave an impression on customers. Heaps of accessories are available to allow you to customise the stands to fit your needs, making your own configuration that is adaptable to easily meet current needs! The extensive online catalogue is available by clicking here, providing you with access to hundreds of different products in a large variety of categories that are designed to fulfill many needs. We add new items to choose from for your business on a weekly basis, helping our customers to stay ahead of the competition by using the latest technologies, trends, & styles to outfit your business to really draw potential clients in and turn them into repeat customers! With so many styles & sizes of business card holders, lecterns, table throws, photo frames, acrylic stands, notice boards, sidewalk signs, hanging hardware, event flags, podiums, whiteboards, iPad displays, cafe barriers, easels, POS signs, & more to pick from, finding the right product for your needs has never been easier! Slimline Warehouse has been a national leader of POP, POS, retail, & exhibition products for over 20 years, creating a loyal customer base in this time that repeatedly come back due to our ever growing selection of high quality products that are sold at low prices not available anywhere else online! We utilise both local & international vendors to offer a selection of items that is second to none, all thoroughly inspected by our quality assurance team prior to purchase in order to make sure our customers only receive products that will have a good return on investment. Our warehouse is able to provide same day despatch with most in stock products that have been purchased by 1pm EST to anywhere in Australia! Order today for your location in Toowoomba, Sydney, Geelong, Canberra, Hobart, Melbourne, Adelaide, Gold Coast, Perth, Cairns, Darwin, Sunshine Coast, Newcastle, Alice Springs, Brisbane, & Wollongong!